THIS PROPERTY IS AVAILABLE FOR LONG TERM RENTAL - 3 MONTHS OR MORE FROM THE 27th SEPTEMBER 2018: To check the availability please click the "availability calendar"
This is a charming, ground floor apartment, with a total of 2 bedrooms and 1 bathroom, situated in the heart of the traditional, Spanish coastal town of Carboneras. 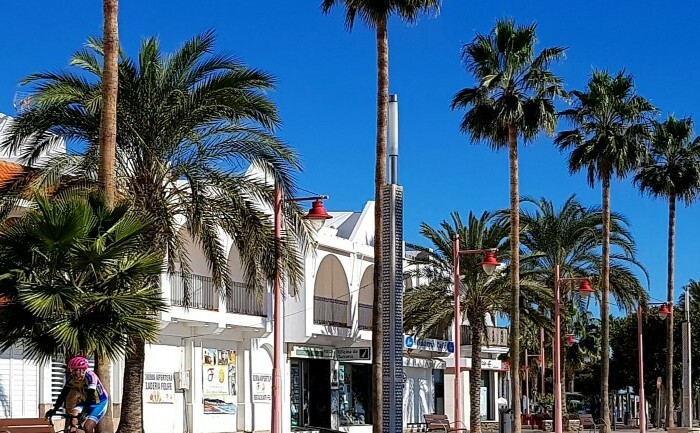 Thanks to this brilliant location, you are within minutes from the beachfront of the town, and the shops are just within a few steps from the front door of the property. The property is accessed from a quiet residential street, which gives you a true sense of the Spanish lifestyle. The entrance of the property leads into a hallway which heads straight into the roomy living space. Leading off of this space are one of the two bedrooms, which currently houses a double bed with side tables. Also leading off of the living space is the dining room, which is more than large enough for a big dining table and chairs. The kitchen leads off of the back of the dining room and is very large, comes with storage space top and bottom and comes fitted with multiple appliances. This space also accommodates a small table with a couple of chairs. There is also a small laundry room and terrace leading off of this space. Also leading off of the dining room is the second bedroom, which currently accommodates two single beds; however this could easily be changed to a double with space to spare. The only bathroom in the property is at the other end of the dining room, is a very good size and comes fully fitted. The property also includes a storage room and comes fitted with air-conditioning.